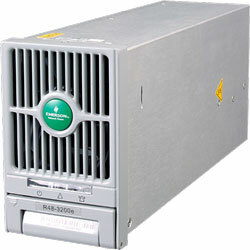 NetSure V200 -48V DC Power Retrofit kit – 486531003, LVPS, 480V, 200A Retrofit PCU is in stock and ready to ship. Emerson Network Power DC Power Systems are powerful solutions for critical data and telecom applications. From major switching and data centers to remote shelters and computer rooms, Emerson DC power systems have the features and proven performance to match your network application needs. The Emerson Network Power line of DC power systems demonstrates unparalleled reliability and industry-leading efficiency ratings at -48 and +24 VDC. Emerson Network Power rectifiers – the heart of the power system – possess some of the highest power densities and smallest footprints in the business. These power solutions can be further enhanced with the addition of intelligent controllers, remote system monitors, battery management units and a full range of distribution modules. The NetSure DC Power technology platform leverages Emerson Network Power’s range of products and services, creating an unprecedented amount of synergy within an integrated DC power solutions platform. The NetSure DC power solution can be customized to fit the exact application. These systems come in extremely dense packages that can be mounted in any indoor or outdoor application for wireless and wireline networks and can be optimized to meet current requirements, while allowing for easy expansion in the future. Liebert UPS Products sustain critical operations that simply can’t go down. 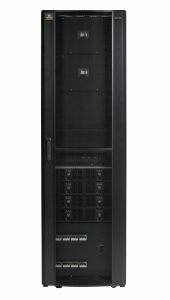 Emerson Network Power delivers a full range of Liebert uninterruptible power supplies (UPS) and power distribution units (PDU), from individual data center solutions to integrated systems that keep network closets, computer rooms and data center infrastructure up and running. The Emerson NetXtend Enclosures offers thermal management, battery backup and room for wireless carrier equipment to meet your cell site application needs. The Emerson NetXtend Equipment Enclosures are a compact and flexible enclosure solution for housing electronics, distribution, and battery backup equipment in outdoor telecom networks. The Emerson NetSure 211 is especially designed for all types of access applications in both fixed and wireless access networks, offering unmatched site installation flexibility. The NetSure 211 Series of compact –48 VDC power systems combines reliable rectifiers with an advanced Ethernet-accessible controller. Engineered for mini power applications, the system is available in two models. 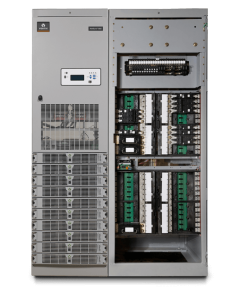 The Emerson NetSure 700 Series DC power systems provide -48VDC, +24VDC or a combination of both voltages at up to 4000 amps. With an efficiency of 96.5% and a modular design that allows for incremental cost-effective system growth, the NetSure 700 Series is ideal for telecom and data centers, colocation and hosting applications. The Emerson NetSure 800 series high-density power systems offer the increased flexibility of a cabled plant in centralized or distributed architecture systems. 5800 watt rectifiers deliver up to 16,800 amps of power at -48 VDC. Individual power and distribution bays may be configured to meet any application requirement. Discretely power critical infrastructure at the edge of your network with optimized management, security, and control with the Emerson NetSure 5000. This series of flexible DC power systems is designed for wireless access and fixed network applications offering unmatched temperature performance and high power density. 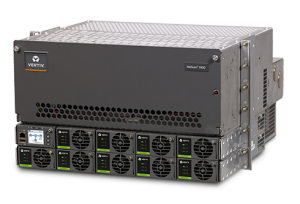 The Emerson NetSure 7000 Series of DC power systems is ideal for applications ranging from radio base stations and small offices to large office and data center facilities requiring high power efficiency, reliability and system availability in a small footprint. 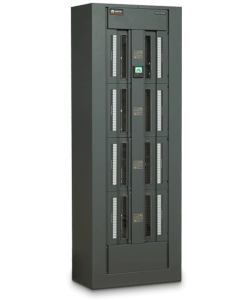 The 7000 Series is ideal for the Telecom, Data Center, Colocations, Hosting, and Government applications. 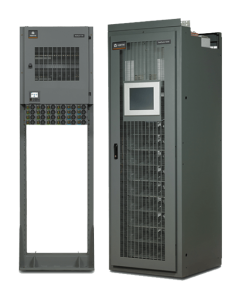 The NetSure 8000 series high-density power systems offer the increased flexibility of a cabled plant in centralized or distributed architecture systems. 5800 watt rectifiers deliver up to 16,800 amps of power at -48 VDC. Individual power and distribution bays may be configured to meet any application requirement. Emerson eSure Rectifiers offer superior performance and uncompromising reliability. The R48-3200e approaches 97% efficiency and is the first of the ultra high efficient eSure rectifier line. eSure rectifiers deliver the most reliability and the highest efficiency in the industry reducing power consumption and lowering operation cost. 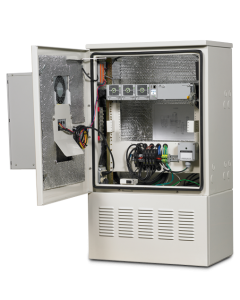 The Emerson NetXtend Equipment Enclosures offers thermal management, battery backup and room for wireless carrier equipment to meet your cell site application needs. The Emerson NetXtend Equipment Enclosures is a compact and flexible enclosure solution for housing electronics, distribution, and battery backup equipment in outdoor telecom networks.